Without going into the bigger picture of discontent in the Arab world, some background. Throughout the Color Revolutions, outside support, from Human Rights campaigners to emigres, has been critical. The world is watching, the world will remember heartens those where civil society has collapsed. But times have changed, and Radio Free Europe no longer strikes fear. Blame is now laid at the door of Twitter and Facebook. And so, for example, during the "Green Revolution" in Iran, the Government interrupted links to traditional media sites, and to social media. Over the last year, Twitter et al have had repeated slowdowns in Tunisia, including reports of activists accounts hijacked. YouTube access had been spotty too. The problem, if you are the censor, is that people are creative. Mirror sites spring up, new domain names are registered, bystanders set up proxies ... . The blockage makes it harder, but not impossible, to communicate, and may even draw non-participants in. It is like putting up barricades to prevent crowds marching to the Plaza de la Revolucion. The crowds treat this as censorship and route around the barricades. And so the Egyptian Government (or at least some part of it) decided to do things right. If you wish to stop people communicating, stop them!. Instead of blocking access to YouTube, Twitter, and an ever-increasing list of newly registered domain names and web sites, they just applied shears to the cables (metaphorically, see below). 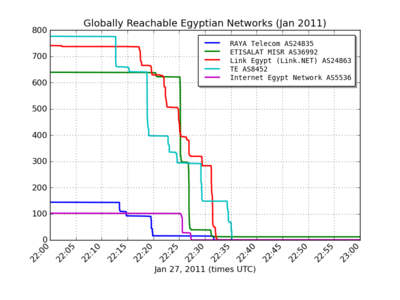 Within 4 minutes (as I see my logs in Singapore), over 4000 networks in Egypt went dead. Stone cold dead. 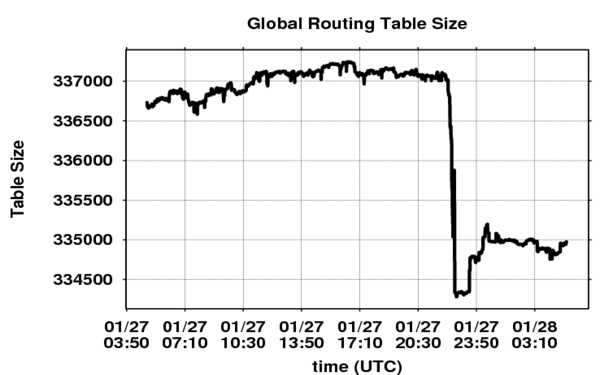 Effectively, the ISP routers on the Internet were told "bye" by Egyptian ISPs. To come back to the barricades analogy, it is like the Egyptian Government abolished all street names and even streets. Good luck deciding to gather for a protest. Actually, this is still the wrong analogy. Imagine all phones exchanges switched off. Oh wait, Bangladesh has done that before. The Internet "works" on various levels, and censors target these levels. At the highest level, you may decide to block certain videos on YouTube (eg, China). This is finely targetted, and collateral damage is low. Or you may decide to block YouTube entirely (Pakistan in 2010). Or you may restrict all social media and user content (if you can define "all"), eg, China, Iran. You can go further, and effectively ban all web access except at Govt-monitored Internet kiosks, with no home accounts allowed, as Cuba does (there are 6 locations in Havana, with week-long waiting lists to use a 30 minute slot). However, all these methods have leakages. Which is what makes the Egyptian example instructive. They just switched off the Internet! Throughout Friday, my view was that the links were disappearing because routers were being switched off. However, a more detailed view (again courtesy Renesys) (shown ahead) shows that the ISPs switched off one-by-one, probably as instructions were authenticated, and support staff told to start withdrawing routing announcements. The slow decay seems more indicative of staff logging into equipment one-by-one, and turning links off. Noor Data Networks (NDN) is the odd case here. Throughout Friday, the speculation was that this was due to the Egyptian Stock Exchange being hosted via NDN, and that someone had allowed the markets to stay open. But Friday, and Saturday, are closed on the Egyptian stock exchange, so that makes little sense. What has been speculated is that NDN is owned by Ayman Nour, ex-MP and presidential candidate, who spent over 3 years in prison after challangeing Mubarak in 2005. Both Ayman Nour and his son, Noor Ayman Nour, have been involved in this week's protests. But as, 24 hrs later, NDN is still alive, either the Government is unwilling to drive up and pull the plug, or there are internal dissensions. Both bode well, in the sense that someone is asking questions. In all this, the Egyptian Government's own sites have also become inaccesible. This does not bode well; it suggests that the authorities hit one big red button indiscriminately. That means we can no longer read official Press Releases, and we will never know the official version of events. Ah, well. A small side-effect is that Egypt was a booming location for Arab websites to host their content. It was seen as a cheap, neutral, business-oriented hosting location. All these are also now non-reachable, so that is one less industry where Egypt can be a successful exporter. There is probably a good note in all this for those who monitor freedom: we can look at ISP withdrawals of networks as a proxy, perhaps, of clampdowns. Probably not for China, where huge investments have been made in the Great Firewall of China, but other countries which may have to resort to blunt measures like this. And yet, does the next President of China, Xi Jinping, a known hawk, plan to have buttons next to his pillow? Press 1 and the Net goes dead, press 2 and the phone system? Imagine what Twitter, or YouTube, could do for the next man who stands up to a tank in Beijing. Now imagine if you were the strong man of China. What do you have nightmares about? By Sunday lunch, Egypt time, the impact on business of this blackout will start being felt, and we may see some networks either returning, or some official communication from the authorities. Till then, perhaps, the old headline from England describes it best: Fog in Channel, Europe cut off. It's a great time to be alive. It gives a whole new meaning to the word `contagion'. A research project idea for all ye economists: Measure the contagion which each of the revolutions triggered off for the stock markets of the dictatorships. On a related note, see: Obama 'Internet kill switch' plan approved by US Senate panel by Grant Gross on TechWorld and Should Obama's 'internet kill switch' power be curbed? by Daniel Nasaw on BBC. One of the many fascinating facts that you see in Economic History and Modern India: Redefining the Link by Tirthankar Roy (Journal of Economic Perspectives, Summer 2002) is about India's trade/GDP ratio. The trade/GDP ratio rose dramatically from 1 to 2 per cent in 1800 to 20 per cent in 1914. By 1970, the trade/GDP ratio had dropped to 8 per cent. It was only in the mid 1990s, the trade/GDP ratio had got back to the 20 per cent value seen in 1914. Most people in India today are not aware of the pre-War world, where goods and services flowed freely across the boundary, when people in India diversified their portfolios across the globe, travelled freely within the British Empire, etc. After the War, there was a big push worldwide to reduce trade barriers. Governments, then, made the call that agriculture was not worth fighting for (since it was a fading share of world GDP but a large number of votes), and focused on manufacturing. By and large, this worked. Trade in manufacturing is pretty free worldwide. But world GDP shifted away from manufacturing. Today, world GDP is dominated by services. World GDP is now 5.8% agriculture, 30.8% manufacturing and 63.4% services. Crudely speaking, if we have full free trade in goods, but zero trade in agriculture or services, then 69% of World GDP is submerged in autarky. Over the last 20 years, manufacturing trade liberalisation has continued, but the share of services in world GDP has risen. I suspect that overall, this has made the world less hospitable to trade. An interesting article on voxEU by Sebastien Miroudot, Jehan Sauvage and Ben Shepherd points out that in the aggregate, the costs of trade have dropped sharply for goods from 1995 onwards, but not for services. We need to work harder on removing a variety of barriers to trade in goods. But we need to work much harder on removing the barriers to trade in services. I don't actively follow the WTO process, but my sense is that there is too much of a focus in the WTO process upon goods, and upon agriculture, while not enough attention is being paid to trade in services. In this sense, the globalisation project is far from done. By and large, the world has done well on removing barriers to the movement of goods and capital (though India is as yet a laggard on both fronts). The two great frontiers are now trade in services and the movement of people. Given the huge footprint of services in world GDP, it is not even the case that we are exposing the world economy to as much global competition as was the case a few decades ago, when manufacturing was a big part of world trade and there was a lot of trade in it. One of the important mistakes that India is making, in terms of integration into the world economy, is in visa rules. A key element of progress there is the new `Visa on Demand' program, which has now been expanded. The list of lucky countries now stands at: Japan, Singapore, Finland, Luxembourg, New Zealand, Cambodia, Laos, Vietnam and Philippines. This needs to now cover the G-20 countries. Another big frontier is setting up convenient access to work visas in order to support the burgeoning need for skilled foreigners who are needed in the Indian labour force. Russell K. Nieli on the power of meritocracy as seen in Caltech. The IITs are similar to Caltech in two respects: No concern for how `well rounded' the background of an applicant is, and no concern in the admissions process for parentage or donations. The IITs do care about caste to some extent in the admissions process, while Caltech cares about nothing other than brainpower. Materials of the 2010 Neemrana conference organised by NCAER, NBER and ICRIER. Sigh. Building a clean environment is hard! Materials from the recent IGIDR finance conference. Annie Lowrey on Slate on the role of prizes in public funding for research. Mobis Philipose on competition against Nifty options at NSE by Nifty options at SGX, and on the problem of transaction taxes and exchange competition. A household survey by CMIE tells us something about how ordinary households see the debate about the Bimal Jalan committee. Sindhu Bhattacharya has an article in DNA about foreign airlines who are being prevented from operating in India. We need a treaty framework that would render such things unlawful. A. D. Miller in the Guardian on why Western authors like Mother Russia. Interesting developments in the freedom of speech. I guess they noticed that if you take the first word on every seventeenth page, it spells out "Death to the Shah". That's nothing, I have a blog that is banned in China! A great story about how grain and oil led to the collapse of the USSR. By Yegor Gaidar. Joe Keohane on boston.com on the odd feature of forecasting: The guy who gets the huge event right is often likely to fare badly in ordinary times. Lant Pritchett says that the notion of an `ethics code' for economists is a silly idea. Frictionless payments are an important contributor to India's growth story. Cash is costly for everyone in the system: for the central banker, banks, businesses, and individuals. Yet, we are far away from a mass adoption of electronic payments. July 2009, Cash withdrawal at point-of-sale guidelines: As a step towards enhancing customer convenience, RBI allowed cash withdrawals at point-of-sale terminals with debit cards. April 2010, Report of the Inter Ministerial Group on the Delivery of Basic Financial Services using mobile phones: This group chaired by the Secretary, DIT and included, among others, representatives from Department of Financial Services, Department of Posts, Ministry of Rural Development, Planning Commission, UID Authority of India, TRAI, RBI, Department of Telecom and the Home Ministry. It suggested a nationwide payments architecture that consisted of a simple centralized account hosting platform as a national infrastructure, full interoperability among payments providers, standards based biometric point of sale terminals, and standards based mobile payments. April 2010, From Exclusion to Inclusion with micropayments: The UIDAI published a strategy document on micropayments, which provides a detailed framework for biometrically authenticated transactions, as recommended by the IMG. The National Payments Corporation of India has developed an interoperability switch for Aadhaar and mobile based transactions as recommended in the IMG report. Both, Visa and Mastercard have also adopted this framework. June 2010, Harnessing the India Post Network for financial inclusion: This report was jointly commissioned and produced by Department of Posts, Department of Financial Services, Department of Economic Affairs and Invest India Economic Foundation. It recommended a framework similar to that recommended by the IMG; that of a low-cost account hosting platform and cultivating a payments ecosystem by allowing partners to access its physical and electronic payments network for a fee. September 2010, Financial Inclusion by Extension of Banking Services - Use of Business Correspondents (BCs): BC guidelines have existed for a while, but RBI recently relaxed the rules for the entities that can act as BCs. These new guidelines allow for-profit companies (except NBFCs) also to become BCs. This appears like a small change but it has had far-reaching consequences. Over these two years, we have a vivid sense about electronic payments making the grade, from a vaguely posed idea for the deep future to something that is tangibly around the corner. Each of these elements appears to be small in isolation, but the link from public policy developments to outcomes is like a butterfly effect. These developments have important ramifications for mass adoption of retail electronic payments and financial inclusion. Banks, recognizing the importance of new regulation, have partnered with telcos with retail networks. This allows for the telco to leverage its network of talk-time retailers as BC sub-agents, and to also offer mobile payments between bank accounts. A flurry of announcements has happened recently: SBI-Airtel, ICICI-Vodafone, Axis-Idea, and more will certainly follow. As much as these announcements are exciting, they raise some worrisome questions. The biggest question is interoperability. If the country is going to have a network of a million BC outlets, shouldn't a customer of any bank be able to use any outlet, much like they can use any ATM? Shouldn't a customer of one bank-telco partnership be able to send money to a customer of another bank-telco partnership effortlessly? Network effects are essential for mass adoption of electronic payments. After all, regulations today allow a person with a debit card to withdraw cash over an interoperable network of point-of-sale terminals. Banks and telcos are unlikely to want interoperability; to justify investments, gain customers, and want them to stick. Perhaps the regulator ought to take a firm stand on the issue. A good balance may be to ensure that the products are designed to be interoperable with some uniformity of customer experience, but offer an interoperability holiday for the first two years. Why did this happen? We have a `Nobody killed Jessica' situation here. Sharad Pawar and D. Subbarao both insist that the problem cannot be laid on their doorstep. I would argue that it was the currency policy from 2003 onwards (large purchase of dollars with partial sterilisation) which gave us this mess, which was then compounded by repeated RBI speeches saying that inflation is not important, and RBI actions which were soft on inflation. The weakness of macroeconomic thinking in official circles is visible, with government actions including banning exports, sending the police to raid traders and hoarders, etc. I believe there is an iron law of economic policy: across each doubling of GDP, you have to reinvent government. The trouble in India is that we are getting each doubling of GDP in a decade or less, giving a very large gap between the structures of government and the underlying conceptual frameworks, when compared with the requirements of the economy. With agriculture at only 15% of GDP, one has to think differently about the role of food in inflation as a macroeconomic phenomenon. 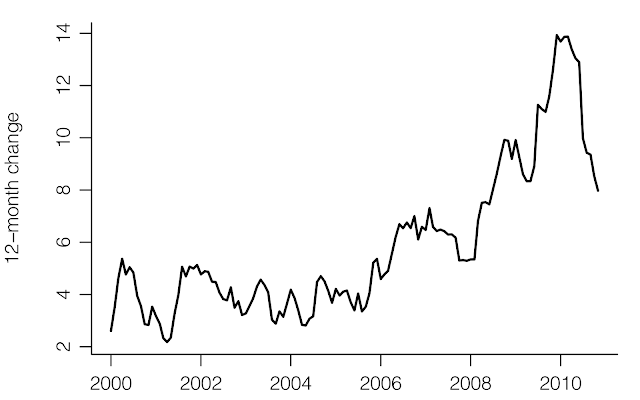 Getting back to stable 4% inflation is terribly important, and it's going to be hard. In recent weeks, Ila Patnaik has written four newspaper pieces which add up to an interesting perspective on inflation: 20 Dec, 25 Dec, 3 Jan, 13 Jan. And, a blog post of mine on food price volatility may also be useful. Today's data release showed y-o-y growth in the Index of Industrial Production: this was at +2.7% in November when compared with the previous value of 11.3%. Some analysts have conjectured that this was driven by seasonal fluctuations including the placement of Diwali, holidays related to Diwali and the reduced number of working days in November. In the jargon of seasonal adjustment, Diwali is termed a `moving holiday': it's a holiday which shows up in different months in different years. Our work on seasonal adjustment includes treatment of the overall IIP and some of its components while controlling for the Diwali effect. Even after this adjustment, the seasonally adjusted annualised growth rate for the month is negative (-1.97%) while the average growth over three months including the current month is 0.18%. IIP consumer goods fared particularly badly (a value of -6.48% for the 3-month average of the annualised point-on-point change of the seasonally adjusted level). Another weak performer was IIP manufacturing (0.017%). However, IIP capital goods shows an encouraging picture with a 3-month average of seasonally adjusted annualised rate of 41.10%. The year-on-year change is the sum of 12 shocks. Ordinarily it has a lot of inertia. It is, indeed, surprising that the y-o-y change flipped from +11.3% to +2.7% for two consecutive months. There may well be major difficulties in the statistical system which are leading to this. We can be pretty confident that the odd behaviour is not caused by seasonal effects. Rick Bookstaber has an interesting post on facebook, which makes you think about the world. It reminded me of the lines: But there's gonna be a meter on your bed / That will disclose / What everybody knows. We used to think of that as a dystopian vision where we collapse into an authoritarian regime, where the liberal project fails. What is surprising is that people are wilfully walking into this surveillance arrangement. In all fairness, what's come about is closer to Lord of the Flies (monitoring by peers) than to 1984 (monitoring by the State). But it's creepy all the same. So my bet – a long term bet because it will take the force of cultural change to accomplish – is that Facebook will become marginalized. It will not disappear, it will remain a repository for factoids about one's collection of friends, but the reality of what Facebook friends really are will become evident, as will the effects of standardization of the individual, the cost to individuality of giving up privacy, and the frustration with having Facebook friends that are increasingly fictionalized and flattened versions of their real selves. I would like for this to be true but I fear this is not the world that we live in.